Figure 1: Topographical Brain Anatomy. This diagram identifies some major Brain functions the control of which lies in these specific areas. The Brain serves as the control center for functions of the body and allows us to cope with our environment. Words, actions, thoughts, and feelings are centered in the Brain. It is so complex that some theorists believe we will never be able to fully understand it. We do, however, know that each part of the Brain has a specific, important function. The left side of the Brain controls the right side of the body while the right side of the Brain controls the left side of the body. Virtually all parts of the Brain interconnect in some way with every other part of the Brain. This extensive interconnecting network is accomplished through a complex system called "Fibre Tracts". The largest of these is the Corpus Callosum, the Fibre Tact that connects the two Cerebral Hemispheres to each other (See Figure 2). Broca's Area which is located in the Opercular and triangular sections of the Inferior Frontal Gyrus. The function of this area is the understanding of language, speech, and the control of facial neurons. Wernicke's Area is part of the Temporal Lobe that surrounds the Auditory Cortex and is thought to be essential for understanding and formulating speech. Damage in Wernicke's area causes deficits in understanding spoken language. The Cerebrum is the largest part of the Brain and is associated with conscious thought, movement and sensation. It consists of two halves, each controlling the opposite side of the body. The halves are connected by a midline Fibre Tract system called the Corpus Callosum, which delivers messages between them. (see Figure 2). The Frontal lobe controls attention, behavior, abstract thinking, problem solving, creative thought, emotion, intellect, initiative, judgment, coordinated movements, muscle movements, smell, physical reactions, and personality. The Motor Cortex is an area located in the Posterior (back) portion of the Frontal Lobe and helps control movement in various parts of the body. The Temporal lobe controls auditory and visual memories, language, some hearing and speech, language, plus some behavior. The Occipital Lobe of the Cerebral Hemisphere is located in the back of the head and controls vision. The Parietal Lobe controls tactile sensation, response to internal stimuli, sensory comprehension, some language, reading, and some visual functions. 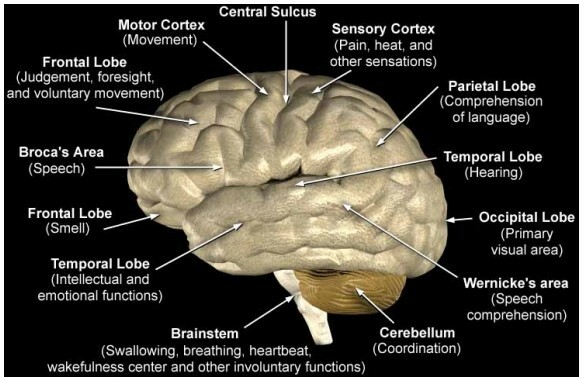 The Sensory cortex is located in the front part of the Parietal Lobe, or in other words, the middle area of the Brain. The Sensory Cortex receives information from the Spinal Cord about the sense of touch, pressure, pain, and the perception of the position of body parts and their movements. Figure 2: The Corpus Callosum is the "largest" Fibre Tract System in the Brain. In a typical infant Brain, the Corpus Callosum develops between 12 to 16 weeks after conception (near the end of the first trimester). While the entire structure develops prior to birth, the fibers of the Corpus Callosum continue to become more and more effective and efficient on into adolescence. By the time a child is approximately 12 years of age, the Corpus Callosum functions essentially as it will in adulthood, allowing rapid interaction between the two sides of the Brain. The Brain Stem is located at the bottom of the Brain and connects the Cerebrum to the Spinal Cord. The Brain stem controls many vitally important functions including motor and sensory pathways, cardiac and respiratory functions, and reflexes. Figure 3: Diagram of the Brainstem with its component parts. The Cerebellum is located at the lower back of the head and is connected to the Brain Stem. It is the second largest structure of the Brain and is made up of two hemispheres. The Cerebellum controls complex motor functions such as walking, balance, posture, and general motor coordination as well as helping non-motor areas do their work more effectively. The Cerebellum contains more nerve cells (neurons) than all the rest of the Brain combined and is a more rapidly acting mechanism than any other part of the Brain. It can process quickly whatever information it receives from other parts of the Brain. It receives an enormous amount of information from the highest level of the human Brain (the Cerebral Cortex), which is connected to the human Cerebellum by approximately 40 million nerve fibers. It has been compared to a powerful computer, capable of making contributions both to the motor dexterity and to the mental dexterity of humans, both of which are required for the emergence of fluent human language. This powerful mechanism at the bottom of the Brain, which every person inherits as a birthright, is immature at birth but develops through childhood and adolescence, reaching its full structural growth by the 15th to 20th year of life. Perhaps the reason why it has traditionally been underestimated is its low-level location in the Brain, which contrasts with the high-level location of the structures that are thought to subserve higher mental functions. Such locations in the Brain become irrelevant, however, when a structure is regarded as a computer because a computer's processing power depends not on where it is but on what it contains and to what it is connected. The Pons is a "knob-like" process that is approximately two (2) centimeters long and located on the anterior (front) aspect of the Brainstem. It is formed primarily by "Fibre Tracts" which are the connecting mechanisms that relay information from one section of the Central Nervous System (CNS) to all the other regions of the CNS. The Pons consists of two (2) major Fibre Tract systems. The first is the Transverse Pontine Fibres that travel from one side of the Pons to the other. Most of the other Fibre Tract systems in the Brainstem (of which there are many) travel in a vertical (up & down) direction. The primary function of the Pons is to relay information between the Cerebrum and the Cerebellum. Other important functions include "Sleep & Arousal Control as well as assisting in "Autonomic Functions". The Medulla Oblongata (commonly referred to as the "Medulla") is the lowest part of the Brain and the lowest portion of the Brainstem. This vital center is connected by the Pons to the Midbrain and is continuous inferiorly (lower) with the Spinal Cord with which it merges at the Foramen Magnum (the large opening at the base of the Skull.) The Cerebellum is located directly behind (posterior) to the Pons and the Medulla. Figure 4: Diagram of the Brain's Cerebrospinal Fluid (CSF) Pathway. Cerebrospinal Fluid (also called CSF) is a clear substance that circulates through, over and around the Brain and Spinal Cord. CSF provides nutrients to and serves to cushion the Brain and Spinal Cord therefore protecting them from injury. This fluid is constantly being produced by an anatomic structure (called the Choroid Plexus) through a process of ultra-filtration of blood. The Choroid Plexus lies within the Brain cavities known as Ventricles. The Four Ventricles of the Brain are connected through a series of channels within the Brain. The CSF courses through the Ventricles to bathe the Brain and Spinal Cord and is then absorbed back into the blood circulation through a reabsorbtion pathway (called Arachnoid Granulations.) As this fluid gets absorbed, more is produced from the Choroid Plexus located in each of the Lateral Ventricles and Fourth Ventricle. A Brain tumor within the Ventricular system or one outside the Ventricles that becomes sufficiently large to press on the Brain and obstruct the internal CSF passageways, can cause a build-up or blockage of CSF flow, a condition known as HYDROCEPHALUS. 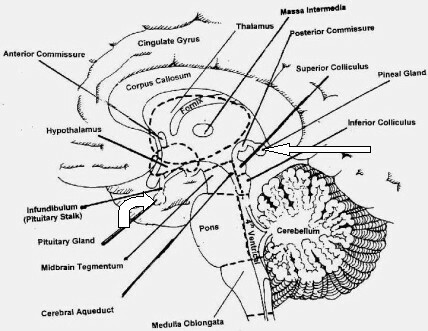 The Pineal Gland (See Figure 5) lies deep within the center of the Brain. It controls the response to light and dark and has been implicated in the syndrome known as "Jet Lag". The exact role of the Pineal Gland is not certain. 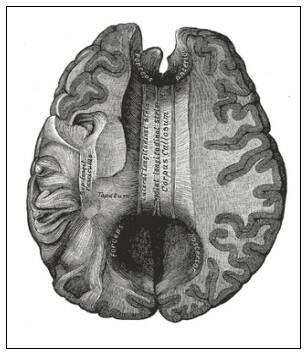 Figure 5: Mid-sagittal section of the Brain. The Pineal Gland (Right "White" Arrow) lies deep within the "center" of the Brain. 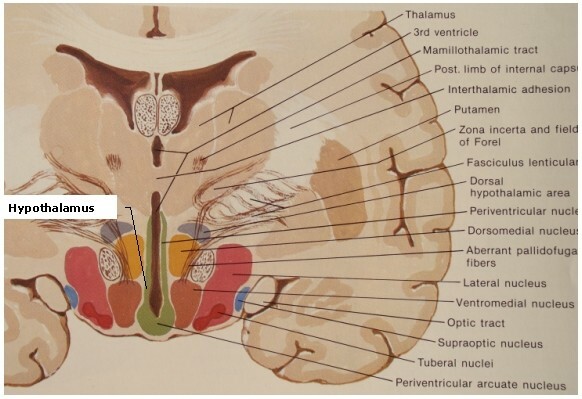 The Pituitary Gland (Left "White" Arrow) lies "underneath" the central portion of the Brain and is connected to the Hypothalamus through its "Pituitary Stalk" (See Figure 5). The Pituitary Gland (See Figure 5) is a small, bean-sized organ that is located at the base of the Brain and is connected to the Hypothalamus by a "Stalk". The Pituitary Gland secretes many essential hormones for growth and sexual maturation. It is generally regarded as the "Master Gland" of the body; however, as in most cases, there is a "higher authority". In this instance the "higher authority" influencing and controlling the Pituitary Gland is the Hypothalamus. The Pituitary Gland secretes hormones which then circulate through the blood stream to exert influence on other hormone producing organs (all part of the Hormone Gland system called the "Endocrine System".) Figure 6 (below) identifies some of the hormones secreted by the Pituitary Gland and the organs that they target. Tumors of the Pituitary Gland can grow to sufficient size that will compress and distort vital Nervous System structures (Cranial Nerves and/or Brain) to result in impaired function including blindness and hormonal dysfunction. Other types of Pituitary Tumors, although remaining small, cause considerable difficulties as a result of an "over-production" of specific hormones that will eventually adversely affect other organs and tissues. See figure 5(below) to appreciate the anatomical relationships. 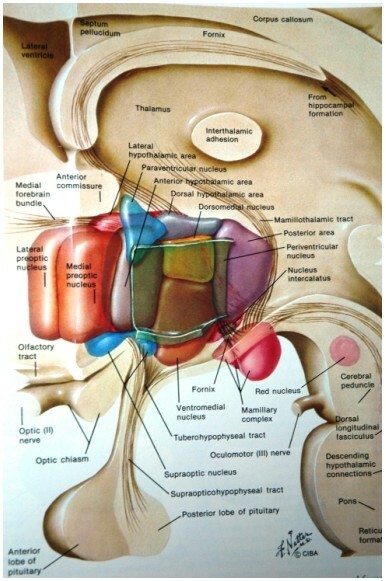 The Optic Chiasm (Figure 6) is located beneath the Hypothalamus and is where the Optic Nerve crosses over to the opposite side of the Brain. 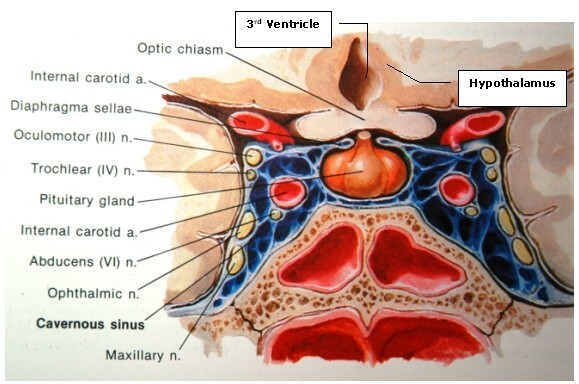 Figure 6: Coronal Section Diagram to demonstrate the relationship of the Pituitary Gland, the Optic Chiasm (part of the Visual sensory system), Cranial Nerves 3, 4, 5 & 6, the Carotid Arteries, the Cavernous Sinus, the Third Ventricle and the Hypothalamus. The Hypothalamus (see Figures 6-9) is a region of the Brain [in partnership with the Pituitary Gland (See Figures 5-8)] that controls the hormonal processes of the body as well as temperature, mood, hunger, and thirst. Figure 7: Anterior Pituitary Gland secretes hormones under the influence of the Hypothalamus (Arrow). These hormones exert "control" over the body's glands that make up the Endocrine system. 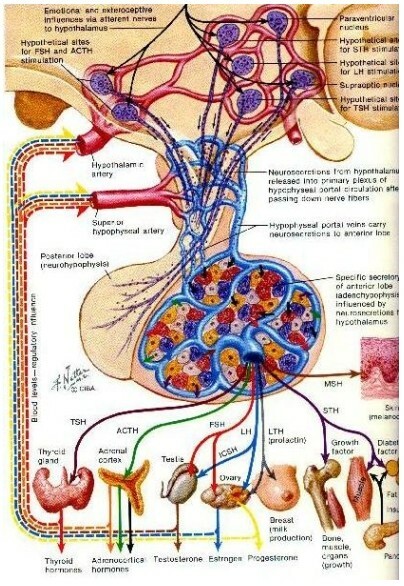 Figure 8: Diagram of the Hypothalamus, Pituitary Gland, Pituitary Stalk, the "control centers" that lie within the Hypothalamus and the "connecting pathways". The Hypothalamus lies within the Third Ventricle. The various "control centers" monitor blood levels of vital components (such as the electrolytes-sodium/potassium, etc.) as well as influencing body core temperature, thirst and hunger. Figure 9: Coronal Section Diagram of the Thalamus, Hypothalamus and Third Ventricle to demonstrate the complex inter-relationships. Compare to Figure 7. The Basal Ganglia are a group of "Nuclei" in Brain's central region that are interconnected with the Thalamus, Cerebral Cortex and Brain Stem. These Basal Ganglia are associated with a variety of functions including: motor control, cognition, learning and emotions. The Thalamus controls input and output to and from the Cerebral Cortex, as well as the sensation of pain and attention. It is one of the Brain's major "relay stations" controlling the "flow" of electronic impulses to and from the Cerebral Hemispheres. There are twelve (12) Cranial Nerves which lie in pairs on either side of the Brain (one set each on the Left and one on the Right). They extend from the Brain and Brain Stem and exit the Skull through specific channels to serve their various functions as outlined in Figure 10. Each is responsible for specific functions. These highly specialized Nerves lie along the Skull Base (a designated portion of the Bone of the Skull). Skull Base Tumors often involve these Nerves which then places their function at risk. 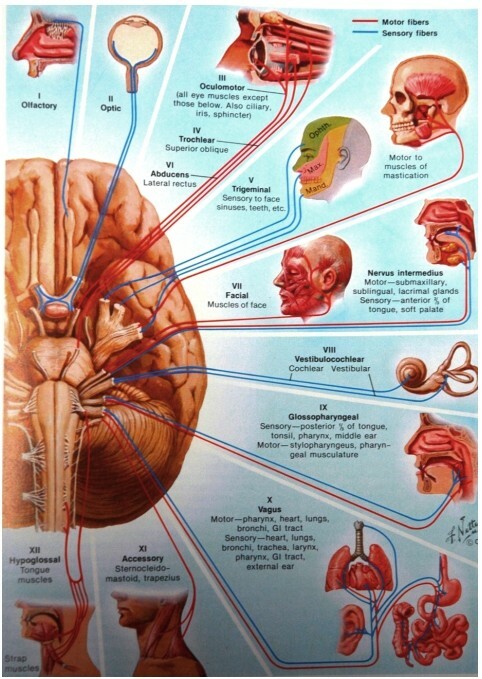 Several of these Cranial Nerves are involved in some unique medical conditions for which there is effective surgical treatment. Figure 11: diagram of the 12 pairs of Cranial Nerves and their Functions. A tumor arising from the Meningeal tissue is called a Meningioma.